It is about time for some chocolate, don't you think? These brownies are ultra rich, ultra chewy, and ultra caffeinated. Enjoy them with a big glass of milk. You don't have to feel too guilty about eating them either, the recipe is from Cooking Light. If you are a coffee fanatic, you could even make a simple coffee glaze to drizzle over the top with powdered sugar, a little instant coffee and a bit of milk. Just stir well to incorporate the powdered sugar then drizzle over the top. If that sounds like too much coffee flavor for you, then you might want to stick with a chocolate or caramel glaze. I had mine plain since that is what the recipe called for, and they are great that way too! Updated: One thing I forgot to add earlier was that freezing these brownies for a few days, then defrosting, made them much less potent on the coffee flavor, and also incredibly moist. If you make these and they have too much of a coffee taste, I highly recommend freezing and trying them after a few days. 2. Coat bottom of a 9-inch square baking pan with cooking spray. 3. Combine coffee and hot water, stirring until coffee dissolves. 4. Combine butter and chocolate chips in a small microwave-safe bowl. Microwave at high 1 minute or until butter melts; stir until chocolate is smooth. 5. Lightly spoon flour into dry measuring cups; level with a knife. Combine flour, sugar, cocoa, baking powder, and salt in a large bowl, stirring with a whisk. Combine coffee mixture, butter mixture, vanilla, and eggs in a medium bowl, stirring with a whisk. Add coffee mixture to flour mixture; stir just until combined. Spread evenly into prepared pan. Sprinkle evenly with toffee chips. Bake at 350º for 22 minutes. Cool on a wire rack. 6. If they haven't all been gobbled up, store leftover brownies in an airtight container for up to a week or wrap tightly in aluminum foil and freeze for up to four months. yum! 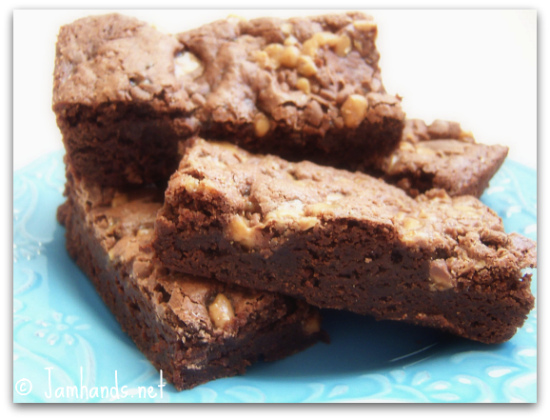 I love espresso brownies..and these are low-fat? That's even better! They look like they're probably fudgy in texture, which is how I like my brownies..I'll definitely have to try these. Those look amazing! I can't wait to try them. these look so dangerously delish that I am not sure whether to drop everything and make them NOW or pretend for the sake of my waistline that I never saw this post? Your brownies look moist and yummilicious. I like the coffee flavor in them. These look beyond wonderful. Seriously. I'm a big brownie and coffee fan so these are right up my alley! Thanks for sharing them on Melt in Your Mouth Monday! We like a lot of similar things--I've made mocha toffee brownies before too, but it's definitely not a light recipe. ha! These sound and look divine. Mocha and toffee is one of my favorite combos. My favorite cake is devil's food with mocha buttercream and toffee pressed into the sides. I call it "Mocha Crunch Cake." soo good! This is my kind of brownie. I cannot wait to make these. mocha? toffee? brownies? delicious? calling my name? yes. yes. yes!!!! :D these look so so so yummy! Thanks for linking up to Creative Juice! Is there anything better than homemade brownies? Only if there's coffee and toffee in them! What an awesome brownie. I love the flavor combination of mocha and toffee, a winner for me. These look great. I would love to see them again at my link party that runs 5pm friday through Sunday! Hope to see you there. You can find the button for it on my blog now if you like. oh, I love a good chocolate brownie. I am going to have to give this recipe a try! Thanks for sharing at Fantastic Friday! Mmm, coffee... Gotta try these sometime when we have a grown up party. Thanks for sharing. Those looks yummy! Thanks for linking this up as well! Oh my... it is way too early to be thinking about chocolate, but now you've done it.. and they are from cooking light too... woo hoo - I need to make a batch!! I am glad that I followed your link from the Sundae Scoop Link Party, I too am linking up if you'd like to visit. Mmmm...sweet coffee, chocolatey toffee goodness! This is such a temptping brownie and I am thrilled you linked it to Bake with Bizzy. I think, these would be good to serve at our famiy barbecue. I NEED one! They look amazing! Thank you for sharing on WWWW! !